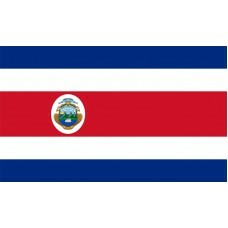 The Costa Rican Flag was designed in 1848 and made official on the September 29th, 1848. 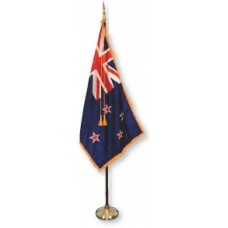 The flag was designed by Pacifica Fernandez Oreamuno, who, at the time, was the President's wife. The flag is referred to as the "Bandera Nacional," and features the colors: red, blue, and white. 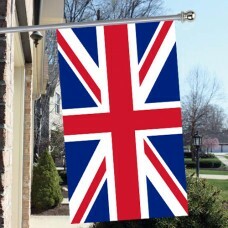 The flag appears to be inspired by the French Tricolor, following the French Revolution. The flag has 5 horizontal bands in the order of blue, white, red, white, and blue. The red band is double the width of the other bands and features the coat of arms. The white color represents "Peace, happiness and wisdom" as well as the independence and freedom from the Spanish. The blue color represents the sky as well as opportunities available to the natives. The red color represents the blood lost for independence as well as the kindness of the natives. The coat of arms that is featured on the Costa Rica flag consists of 3 volcanoes, which represent Cordillera Guanacaste, Cordillera Volcanica Central, and Cordillera Talamanca. It also features the Central valley with two ships on either side of it, which represent the Pacific and Atlantic Oceans, and the sun in the top left-hand corner represents the beginning of Costa Rica as a new nation. Each side of the coat of arms features gold beans which represent coffee beans which are prevalent in the country, and the 7 stars at the top symbolize the 7 provinces, which are, San Jose, Cartago, Alajuera, Heredia, Limon, Puntarenas, and Guanacaste. 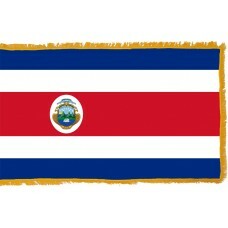 Since 1848, the Costa Rica flag has been updated 3 times and since 1821 it has changed 10 times. Costa Rica was a colony under the rule of Spain for over 250 years from 1561–1821, when they declared their independence. Whilst Costa Rica was under the Spanish, it was described as "the poorest and most miserable Spanish colony in all America" by a politician. Costa Rica didn't actually fight for independence, but it was given on September 15th, 1821 following the Mexican War of Independence when Spain was defeated and the authorities in Guatemala declared independence on all the countries in Central America. September is a very important month in Costa Rica as their independence is widely celebrated. Every September 14th, there is a lantern parade, that pays tribute to Dolores Bedoya, who took people with her to the Guatemala government office to influence them to sign the independence declaration. That evening, lanterns were carried by all to guide the way. Costa Rica, which translates as "Rich Coast," is a country in Central America that shares borders with Nicaragua, Panama, the Caribbean Sea and the Pacific Ocean. The capital city of Costa Rica is San Jose. The country is also known as "The Switzerland of Latin America," due to the natural beauty and political stability. It was known as the "Rich Coast" following Christopher Columbus's visit in 1502, when he witnessed the majority of the natives wearing vast amounts of gold jewellery. Costa Rica is home to 14 volcanoes, 6 of which are still active. One quarter of the country consists of national parks and refuges making it a great wildlife attraction, which is the main reason that it has been voted as the most popular and favourite place in Central America for tourists to visit. Peace reigns, white and pure. Gained eternal renown, esteem and honour. Exchange their rustic tools for weapons. Gives us sweet sustenance and shelter. May peace and labour ever live!